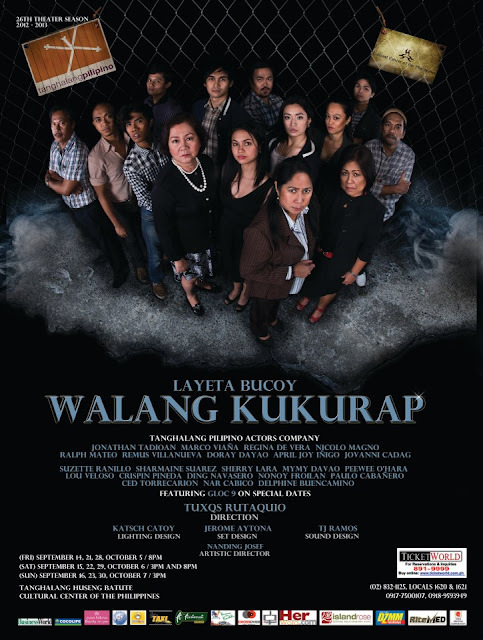 Tanghalang Pilipino presents a political satire play, Walang Kukurap written by Layeta Bucoy and directed by Tuxqs Rutaquio. This will be shown at the Tanghalang Huseng Batute of the Cultural Center of the Philippines from September 14 to October 7, 2012. With the approaching midterm legislative and local elections next year, Walang Kukurap is set in an ordinary town in the Philippines, as it explores the dynamics of traditional politics and the emerging brand of politics brought about by first time politicians. It follows the story of five families who are intertwined in the political landscape of a town ruled by black money and opening itself up to an impending political dynasty and the detestable tentacles of opportunism. Cristina Medina, the widow of the slain former mayoralty candidate Marco Medina runs for vice mayor, banking on her husband's good surname. Though her husband advocated good governance, she runs for money, and thus finds herself in the middle of the traditional web of violence, corruption, and power struggle. Her niece Rhoda plunges into the political fray upon the prodding of her mother Melba who has long resented the comparison between her husband and Cristina's husband. Trying to retain their hold over the town are Purita and Molong, a couple who is a product of calculated political maneuverings as Purita's businessman father guided Molong's rise from Boy Scout personnel to town mayor. A victim of unfortunate circumstances, tricycle driver Panchang tries to bring an oasis of order in her family's economic chaos by transacting with the powerful, abiding to the rules of their game, and thus having a taste of misguided victory. Businessman Santiago enters the political landscape, a former Bureau of Customs official with unexplained wealth, intending to rule over the town's economy by conquering its political sphere. Well meaning Doray, a university science professor, tries to stand by what is good for the town, but as she herself runs for mayor, a series of unfortunate events hamper the goodness that she has to offer. Interspersing their stories are gambling and drug lords Alex and Lu and an armada of young adults who struggle with this generation's political and economic realities. As all of the characters try to prevail within a corrupt system, the audiences are taunted, teased about the political realities in their respective towns, and eventually, in order to ensure the election of the deserving candidates, challenged to be vigilant, to not even blink in choosing to whom they are to give their sacred votes. Cast includes: SUZETTE RANILLO, NAR CABICO, SHERRY LARA, DELPHINE BUENCAMINO, MYMY DAVAO, DING NAVASERO, CRISPIN PINEDA, PAULO CABANERO, PEEWEE O'HARA, NONOY FROILAN, LOU VELOSO, SHARMAINE SUAREZ, CED TORRECARION. With the members of the TP Actors Company: JONATHAN TADIOAN, MARCO VIANA, REGINA DE VERA, NICOLO MAGNO, RALPH MATEO, REMUS VILLANUEVA, DORAY DAYAO, APRIL JOY INIGO, JOVANNI CADAG. Tickets are also available at all TicketWorld Outlets. Call (632) 891-9999.